To continue on from earlier work (here and here), I will follow further the assignment sequence expected of the students in ENGL 112: Composition. The second paper they are asked to write is a rhetorical analysis of a classroom-appropriate* advertisement; as with the earlier profile, they are asked to precede their work on the main paper with a planning sheet. Since they are asked to do it, I will be doing it, as well, in the continued hopes that I can help my students and others by doing so. The first task was to select an advertisement to review. Given the sheer number of such available, even within the rubric of “classroom appropriate,” it was not an easy thing, at least at first. Faced with the over-abundance of examples, and feeling that I ought to make the exercise work for me as well as for my students, I focused my attention on my own interests and prior efforts for the class. (Following up on earlier course materials helps in many cases.) 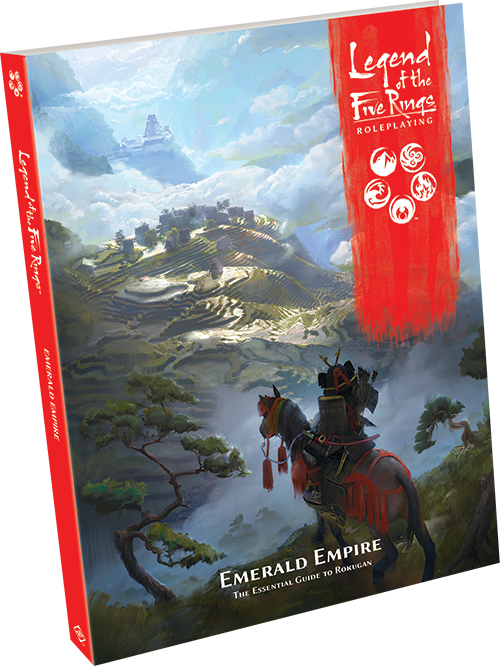 In terms of Google image searches to run, I went from “advertisement” to “classroom appropriate advertisement” to “advertisement Legend of the Five Rings.” Said search yielded a plethora of results, so I applied my existing knowledge to winnow the results down to those reflecting the current holder of the intellectual property of the game, Fantasy Flight Games. And, since I primarily play the role-playing game, I focused on that, selecting the promotional material for a specific supplement. With the advertisement selected, I moved on to setting up the document for my response. As before, I eschewed the University-provided template, setting up a document on letter-sized paper with one-inch margins and single-spaced 12-point Times New Roman type. (It is not APA standard, I know, but the document is not of the sort as demands it. Rather, it follows the sample profile plan I did earlier.) I also stubbed out sections and prompts from the assignment documentation. Directions for completion were highlighted to attract attention and to serve as a reminder for later deletion. The called-for URL linking to the advertisement was easily inserted early on; I did so to be sure it got done. I began then to address the other prompts in the document. Context for the advertisement and a description of it received attention, followed by specific work on the advertisement’s deployment of logos, ethos, and pathos. Along the way, I checked APA style guidelines to be sure I was presenting materials in a way that would oblige minimal adjustment later. I had needed to do the descriptive work because I had needed it in place to come up with the thesis for which the later analysis calls. Once I had that work done, I was able to address the issue of whether or not the advertisement would likely succeed with its presumed purpose and audience, and I needed that information to draft the introduction and conclusion for which the current exercise called. Having it, I did so. The content made ready, I deleted my highlighted notes and reviewed my document for style and mechanics. After making the adjustments that needed making, I rendered the document into an accessible format, which I present here: G. Elliott Sample Rhetorical Analysis Planning Sheet November 2018. May my readers use it in good health! *As might be imagined by those who know me, either in person or from reading what I write, I have…issues with such a term. Since I’ve already treated the matter, I’ll not belabor the point at this time. I hope I can count on you helping to keep this kind of thing going.